5. Anti-Aging Research Center and Department of Biochemistry, Dongeui University College of Korean Medicine, Busan 47227, Republic of Korea. Introduction: Trichinella spiralis establishes a chronic infection in skeletal muscle by developing nurse cells within muscle fibers. During symbiosis in host, changes in the muscle fibers and inflammation may affect muscle function. Methods: We investigated muscle strength and inflammation in T. spiralis-infected mice during 1 to 48 weeks after infection. Results: Muscle strength decreased compared to that in uninfected control mice during the late infection stage. Additionally, inflammatory related cytokines increased significantly during early stage of infection and then rapidly decreased. In pathological study, nuclear infiltration maintained from the early infection stage to chronic infection stage. Moreover, vacuoles and eosinophil infiltration were observed in infected muscle in chronic stage. Conclusion: These results suggest that infection by T. spiralis significantly affects muscle function was continuously being weakness because vacuoles formation and maintained nucleus and eosinophil infiltration during chronic phase of T. spiralis infection. Trichinella spiralis, a tissue nematode, infects mammalian skeletal muscle cells and forms a nurse cell-larva complex. Infection of myocytes by newborn Trichinella larvae initiates de-differentiation, cell cycle arrest and re-entry of infected muscle cells [1,2]. Differing effects of parasite infection on skeletal muscle strength have been previously reported. Rau and Putter  suggested that T. spiralis infection in striated skeletal muscle may lead to muscle weakness and potentiates difficulties in the competitive fitness of the host that may lead to an increased susceptibility to predation. Vermillion and Collins  demonstrated that T. spiralis infection increased the contraction of intestinal muscle and heightened muscle function in rats, probably due to an adaptive host response. Alternatively, Chieffi et al. 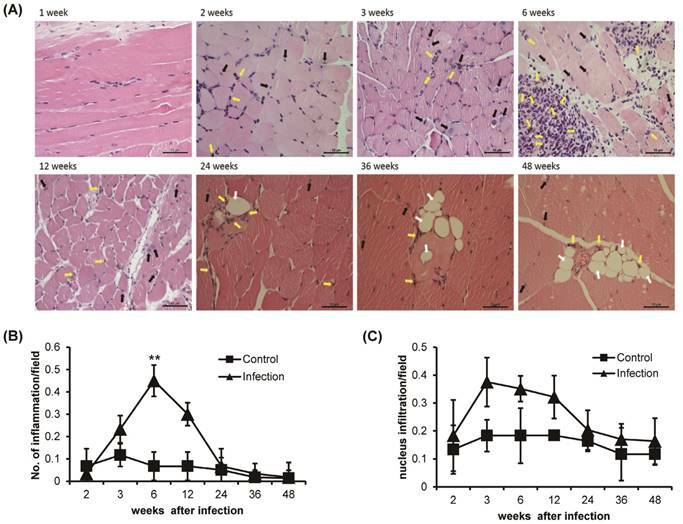 noted that muscular strength in the forefeet of rats infected with Toxocara canis was not different from that of the control group at 10 days post-infection, although muscle impairment was evident at 30 days post-infection. Recently, skeletal muscle has attracted great interest as a new endocrine organ. Rossi et al. reported that interleukin (IL)-6 and IL-1α are constitutively expressed in human myoblasts, while IL-1β and tumor necrosis factor (TNF)-α are detected only after treatment with pro-inflammatory cytokines. IL-6 was also reported to be produced locally in skeletal muscle in humans and rats in response to exercise [7,8]. Keller et al. suggested that IL-6 expressed in contracting skeletal muscle increased plasma IL-6 concentration during prolonged exercise, which may serve as a signal for the liver to enhance glucose production. Bautmans et al. also reported that reduced grip strength and increased fatigue were significantly related to the concentrations of circulating IL-6 and C-reactive protein but not to TNF-α or fibrinogen concentration in skeletal muscle. Additionally, eosinophilic myositis constitutes a group of rare, clinically and pathologically heterogeneous disorders characterized by eosinophil infiltration of skeletal muscle. Parasitic infection is the commonest cause worldwide, but it can also be a feature of other conditions such as hyper-eosinophilic syndrome or muscle dystrophies . Eosinophilic myositis is characterized by infiltration of the skeletal muscle tissue (variably an invasion of necrotic muscle fibres) by eosinophils, possibly in association with peripheral blood and/or bone marrow eosinophilia [12-14]. Also, a vacuole is a membrane-bound area of a muscle fiber that may contain various cellular components or enzyme. The function of a vacuoles can be a useful pathological indicator, myopathies, muscular dystrophies and neuropathies [15,16]. Almost diagnosis of eosinophils and vacuoles is made histo-pathologically. After a newborn larva of T. spiralis enters a skeletal muscle cell, it develops into an infective muscle-stage larva and can survive for years, depending on the host species. Although the majority of the T. spiralis infection cycle is performed in the muscle, most studies on T. spiralis infection have been focused on systemic or intestinal responses. In this study, we investigated changes in striated muscle strength during T. spiralis infection. In addition, in order to explain the change in muscle strength in T. spiralis-infected mice, we measured the pathology feature, inflammation pattern, eosinophils and nuclear infiltration, vacuoles observation, and the mRNA expression level of several cytokines related to muscle inflammation and infection in infected skeletal muscle. T. spiralis was kindly provided by Dr. Lee of Korea University (Seoul, Republic of Korea) and was maintained and recovered as previously described . BALB/c mice (6-8 weeks of age, 20-24 grams of body weight, Samtako Bio Korea, Osan, Republic of Korea) were infected with 250 L3 larvae and were sacrificed at 1, 2, 3, 6, 12, 24, 36 or 48 weeks after oral infection. Gastrocnemius muscle samples were used for analysis of cytokine secretion and histological studies. All experiments were performed under protocols approved by the Kosin University College of Medicine Animal Care and Use Committee (Busan, Republic of Korea). The wire-hanging test, which was slightly modified from Shukitt-Hale et al. , was performed to measure muscle strength. The forepaws of each mouse were placed on an elevated taut horizontal wire (17 cm above the table top). Each mouse performed one trial per test session, and the total hanging time in seconds was recorded (max score 180 s). The hind legs of the mice were tied with cellophane tape to prevent animals from lifting their upper bodies above the wire. Left infected-gastrocnemius tissues were fixed with formaldehyde and embedded in paraffin. Thin sections of the embedded tissues were then stained with hematoxylin and eosin (H&E) and imaged under a light microscope (Carl Zeiss, Oberkochen, Germany) using a 400X objective. We performed histological analyses of the inflammatory responses and nuclear infiltration after T. spiralis infection. Hematoxylin and Eosin (H&E, Sigma-Aldrich Chemical Co., St. Louis, MO, USA) staining was performed on all gastrocnemius muscle samples. Twenty non-overlapping representative fields of the tissue were examined microscopically using a 400X objective, and the number of inflammation fields, eosinophil, nuclear infiltration and vacuoles formation were measured and vacuoles were observed. Cytokine gene (IL-5, IL-6, IL-10, IL-25, TNF-α, and transforming growth factor (TGF)-β) expression was assessed by RT-PCR using total RNA from three independent mice infected for different periods of time. The chronic infection (90 days after infection) group was compared with an age-matched control (4-month-old mice) group. Gastrocnemius muscle tissues were lysed, and total RNA was isolated with TRIzol Reagent (Invitrogen Life Technologies, Carlsbad, CA, USA). After RNA quantification, 1 μg of RNA was used to generate cDNA using AccuPower®CycleScript RT PreMix (Bioneer, Daejeon, Republic of Korea). PCR was performed using the AccuPower®HotStart PCR PreMix (Bioneer). The specific amplification protocol was as follows: 95°C for 5 min, followed by 35 cycles of 95°C for 30 s, 55°C for 30 s, and 72°C for 30 s, and a final incubation of 72°C for 5 min. The PCR products were separated on a 2% agarose gel and visualized by ethidium bromide staining. GAPDH was used as a loading control. The densities of all bands were analyzed by Image J (NIH, Bethesda, MD, USA) and adjusted based on the level of GAPDH. The primers used in this study are shown in Table 1. The two-tailed Student's t-test was performed to evaluate statistical significance among groups. P-values less than 0.05 were considered statistically significant. We counted the number of nurse cell in the gastrocnemius muscle of T. spiralis-infected BALB/c mice. The number of nurse cells was highest at two weeks after infection and decreased sharply after this (Figure 1A). This result suggests that, during primary infection, T. spiralis continuously struggles against the host immune system, and that only those that survive this phase go on to establish a chronic infection. The muscle strength of T. spiralis-infected mice was measured through a wire-hanging test. There was no significant difference in muscle strength between the infected and control groups at 2 weeks of infection. However, muscle strength was decreased at 3 weeks and significantly reduced at 6 weeks of infection (Figure 1B). Subsequently, muscle strength was recovered to a level similar to those of the control group at 12 weeks of infection, but muscle weakness of infected group was significantly presented again compared to control group during chronic stage, from 24 to 48 weeks (Figure 1B). These results suggest that infected muscles cannot restore normal function even after worm expulsion. The change in number of nurse cells over time during T. spiralis infection and muscle strength of T. spiralis-infected mice. (A) The number of nurse cells in gastrocnemius muscle from T. spiralis-infected Balb/c mice was counted from H&E-stained slides. Twenty non-overlapping representative fields of tissue were analyzed under a light microscope using a 400X objective. The number of counted nurse cells per field is shown. (B) A modified wire-hanging test was performed to measure muscle strength. Mouse forepaws were placed on an elevated taut horizontal wire (17 cm above the table top). Each mouse was given one trial per test session, and the total hanging time in seconds was recorded (max score 180 s). The hind legs of mice were tied with cellophane tape to prevent animals from lifting their upper bodies above the wire. The muscle strength test was performed using 10-20 mice per group. Histological observation of H&E-stained T. spiralis-infected gastrocnemius muscle clearly showed inflammation around the nurse cells and nuclear infiltration, which are indicators of early inflammation (Figure 2A). The level of inflammation around the nurse cells or surrounding muscle was significantly increased sharply around 6 weeks of infection and gradually decreased thereafter (Figure 2A and B). Nuclear infiltration also peaked at 3 weeks of infection. However, after 6 weeks, the degree of nuclear infiltration decreased and was maintained at a lower level than that seen in control animals until the 48 weeks of infection (Figure 2A and C). The infiltration of eosinophils was showed after 2 weeks of infection, nurse cell formation point. The eosinophil infiltration was time-dependently increased at 6 weeks of T. spiralis infection. The level of eosinophil infiltration was decreased after 6 weeks, at same time, nurse cells were removed in gastrocnemius muscle. Some infiltrated eosinophil was maintained in infected muscle until 48 weeks of infection (Figure 2A). Also, the vacuoles were observed in infected skeletal muscle after 24 weeks of infection. The vacuoles were continuously observed until 48 weeks of infection and eosinophil found around the vacuoles (Figure 2A). These results showed that the myopathies were generated in gastrocnemius muscle through inflammatory response such as nucleus and eosinophil infiltration, and vacuoles formation, as the T. spiralis infection continues. In order to identify the relationship between inflammation-induced cytokines and muscle strength, we analyzed several key cytokines related to infection and inflammation. IL-5 decreased during the early infection period, and this decrease was maintained until the chronic infection period (Figure 3). IL-6 was significantly induced 2 weeks after infection and then slowly decreased. IL-10 was induced during the early infection period, peaked on weeks 6 of infection, and was maintained at almost the same level as in controls during the chronic infection period. By contrast, IL-25, TNF-α, and TGF-β were not significantly altered during any of the periods of infection (Figure 3). When human hosts are infected with T. spiralis, the most common clinical manifestation is muscle weakness including myalgia. This results from muscle damage due to nurse cell formation by the infecting larvae. As is well known, Trichinella larvae induce a severe inflammatory reaction after entering skeletal muscle tissue, which is responsible for the associated myopathy. However, the effect of T. spiralis infection on muscle strength in infected mice is still unknown. Here, we first analyzed muscle strength in T. spiralis-infected mice from early infection (1 week after infection) to chronic infection (48 weeks after infection) stages. We also compared muscle inflammation and cytokine expression in order to evaluate the relationship between muscle strength and inflammation in T. spiralis-infected mice. As shown in the muscle strength analysis, the strength of skeletal muscle decreased significantly in T. spiralis-infected mice from 3 to 6 weeks after infection. Subsequently, muscle strength was recovered during the chronic infection period (from 12 weeks after infection) but, strength level was meaningfully decreased in infected-group than control group until 48 weeks after infection. Cytokines are one of the most important factors in initiating inflammation and contribute to muscle dysfunction or weakness. Skeletal muscle produces a number of cytokines in response to environmental stimuli such as muscle infection or exercise. We observed that the level of IL-6 mRNA increased dramatically on 2 weeks after infection and then returned to almost the same level as seen in controls by 6 weeks after infection. IL-6 is well-known as the first discovered myokine and is released from muscle cells to control metabolic processes in other tissues. Steensberg et al. noted that IL-6 production from exercised muscle was correlated with high plasma IL-6 concentration. Morales et al. also observed IL-6 gene expression in peripheral blood mononuclear cells from T. spiralis-infected humans stimulated with crude worm extract. These results reveal that high expression of IL-6 in infected skeletal muscle can lead to systemic induction of IL-6, which has been reported to act as both a pro-inflammatory cytokine and an anti-inflammatory myokine . Although our results showed a high expression level of IL-6 in early infection, the manner in which IL-6 is working in this instance remains to be determined. After 2 weeks of infection corresponds to the time at which nurse cells are most numerous in muscles, it is presumed that IL-6 may induce either an inflammatory or anti-inflammatory effect. Furthermore, there have been significant studies on the relationship between angiogenesis and IL-6 expression in tumors and skin fibroblasts. IL-6 treatment induces vascular endothelial growth factor mRNA expression in various cell lines in order to stimulate angiogenesis [22-24]. It seems reasonable to assume that IL-6 expressed in infected skeletal muscle can affect angiogenesis related to nurse cell formation. However, more detailed studies of the role of IL-6 in angiogenesis for the formation of nurse cells are required. IL-10 is a major anti-inflammatory cytokine whose pivotal role has been reported in early inflammation in the T. spiralis muscle infection stage. IL-10 restricted inflammation during the early stage of muscle infection . Our results also demonstrated that IL-10 increased continuously and peaked at 42 days after infection, while muscle inflammation began to decrease beginning at day 42 after infection. These responses suggest that IL-10 expression might have an effect on muscle anti-inflammation caused by T. spiralis infection. TNF-α is involved in systemic inflammation and apoptosis. The TNF-α/TNF receptor 1 signaling pathway has also been reported to be involved in nurse cell formation through apoptosis and anti-apoptosis . We also observed an increase of TNF-α in muscle samples, although this increase was not statistically significant. Histological analysis of T. spiralis-infected gastrocnemius muscles. A. Inflammatory cells, eosinophil (yellow arrow), nucleus infiltration (black arrow) and vacuoles counting (white arrow) in gastrocnemius muscles. B. Amount of inflammation, containing eosinophil, in control and T. spiralis-infected gastrocnemius muscles. C. Amount of nuclear infiltration in control and T. spiralis-infected gastrocnemius muscles. Twenty non-overlapping representative fields of tissue were imaged under a light microscope using a 400X objective, and the number of inflammation and nuclear infiltration in a field were counted. The histological test was observed 10-15section per muscle tissue and used 5 mice per group. Conclusively, IL-6, TNF-α and IL-10 mRNA expression was enhanced in skeletal muscle during acute time of T. spiralis infection. IL-10 was shown to inhibit inflammation during the muscle stage of infection. Muscle weakness caused by T. spiralis infection was most noticeable on 6 weeks of infection, and this timing was consistent with the most severe inflammatory period. Measurement of muscle cytokine gene expression. Cytokine gene (IL-5, IL-6, IL-10, IL-25, TNF-α, and TGF-β) expression was assessed by RT-PCR in three independent mice for each infection period. The chronic infection (90 days after infection) group was compared with an age-matched control (4-month-old mice) group. All bands densities from agarose gels were analyzed by Image J and adjusted based on the level of glyceraldehyde 3-phosphate dehydrogenase (GAPDH). Histological analysis of muscle inflammation showed that the decrease in muscle strength was accompanied by an inflammatory response. Nuclear infiltration, which is considered to be a sign of early muscle inflammation, also peaked at 3 weeks after infection but was reduced to a low level compared with control groups at later times of infection. In addition, inflammation and eosinophil infiltration was most severe at 6 weeks after infection, and muscle strength was also lowest at same times. Additionally, the myopathies, vacuoles, were observed after 24 weeks of infection. The vacuoles were continuously observed until 48 weeks of infection, chronic stage, and eosinophil found around the vacuoles. The vacuoles in myofibers are thought to be due to the accumulation of autophagic vacuoles and were reported that can be characteristic in certain myopathies and muscle weakness [27,28]. Our data demonstrate that at acute stage of T. spiralis, skeletal muscle weakness was caused by inflammatory responses such as pro-inflammatory related cytokines expression, nucleus, inflammatory cell, especially eosinophils, infiltration in infected-skeletal muscle. Furthermore, the weakness of muscle was persisted by steadily infiltrated of nucleus and eosinophil and vacuoles formation as chronic stage of infection. This research was supported by Basic Science Research Program through the National Research Foundation of Korea (NRF) grant funded by the Korea government (2018R1A2B2005705).